There are many ways ORACUL intends to pursue and promote the research of ancient cultures. One way is through field projects. Below are examples of what we have in mind as the organization moves forward with your support. During seismic studies around the Great Sphinx undertaken by Thomas Dobecki and Robert Schoch in the early 1990s a major discovery was made – a rectangular chamber was found located under the left paw of the Sphinx. In plan view it is about twelve meters long in an east-west direction by nine meters wide in a north-south direction, and it may lie approximately five meters below the current level of the floor of the Sphinx Enclosure (it is difficult to estimate its depth). 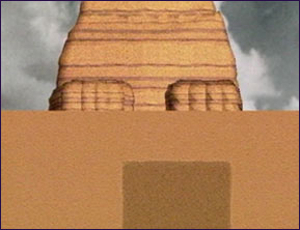 The entrance to this chamber could be located in the cliff face (also found using seismic techniques) east of the Sphinx Temple, now buried under many meters of sand. Thus far the chamber under the Great Sphinx has not been probed (such as via drilling and insertion of a small camera), entered, or excavated. This is a task that Dr. Schoch has wanted to pursue for a quarter century; however, various factors, from financial to political, have impeded the research. Now, with the establishment of ORACUL and the recent changes in the political landscape of Egypt, the time may be right to move forward with this important research. Furthermore, this may be a time-sensitive issue, for the rising water table, due to modern “development” and the current large population of Cairo and its surrounding regions, may be flooding the chamber, potentially damaging any artifacts that it holds. What might the chamber contain? The seismic signature suggests that the chamber is not empty. Could the contents date back to a time well prior to the dynastic period, as the core body of the Sphinx does? Exploration of this chamber under the Great Sphinx is high on the list of ORACUL field projects, as it could yield untold archaeological wonders! 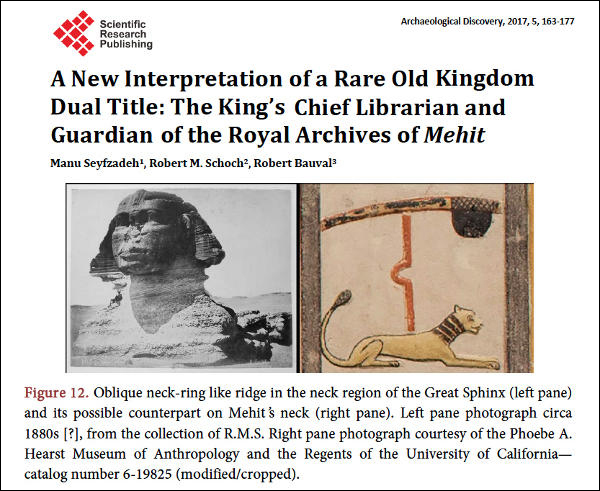 In 2017 new textual evidence was found stating that the statue we now know as the "Great Sphinx" was originally the lioness Mehit, and she guarded an ancient archive (a library or set of records), which we believe corresponds to the chamber found seismically under the left paw of the Sphinx (see this article for more information). 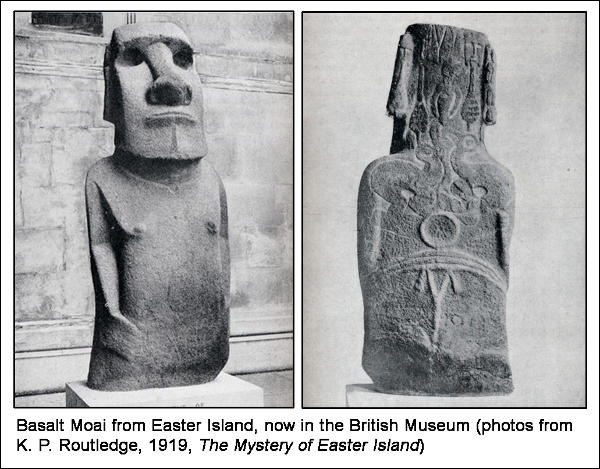 During preliminary reconnaissance trips to Easter Island, Dr. Schoch found evidence that the earliest moai (those large stone heads and torsos for which the island is rightfully famous) differed materially from the later moai. The earliest moai appear to have been more finely worked from hard basalts as compared to the volcanic tuffs from which most moai, dated to later periods, were carved. The few surviving basalt moai have either been found at deeper stratigraphic levels, below other moai and the platforms on which later moai were erected, or the basalt moai were reused in later structures, thus indicating the basalt moai are among the earliest on the island. A major puzzle, which is directly applicable to the chronology and dating of the moai, is the matter of where various moai were quarried. Quarries on the rim of the volcanic crater, where large moai were carved from the volcanic tuffs, are well exposed and still contain partially carved moai in place. However, the quarries where the few basalt moai were carved have never been definitively located, despite the small size of the island. 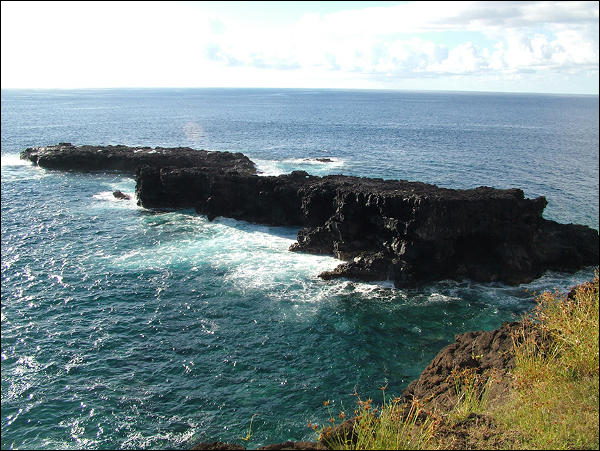 Based on the geology of Easter Island, Dr. Schoch hypothesizes that suitable basalt deposits may occur lower in the stratigraphic section, so low in fact that they might currently be under sea level off the coast of the island. That is, the basalt quarries might be underwater. How could this be? It is difficult to conceive that the ancient Easter Islanders were quarrying rock below sea level. Alternatively, the “lost basalt quarries” might be under sea level now because they are of extreme antiquity, and thus the basalt moai carved from them are extremely ancient. Sea levels have risen dramatically since the end of the last ice age and if the basalt moai were quarried along the coast of Easter Island from areas since inundated by the sea, this could help to date the basalt moai and is immediately suggestive that they are considerably older than conventionally believed to be the case. It is already more than pure speculation that the basalt moai may have been quarried from areas that are now underwater. While on the island Dr. Schoch and his wife, Catherine Ulissey, heard of reports that when the French marine explorer Jacques-Yves Cousteau (1910–1997) and his divers visited the island they came across some very rectangular-looking holes or cavities in the basalt layers located off the coast. Could these indeed be ancient quarries? An ideal project for ORACUL is an expedition to Easter Island to pursue these leads, including underwater exploration off the coast, to locate and date any basalt quarries. 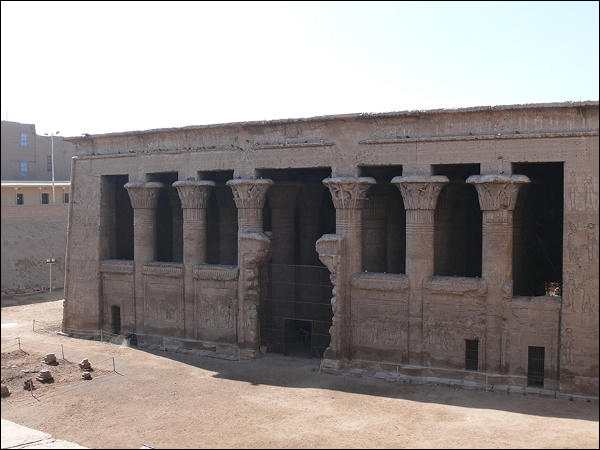 The city of Esna, in Upper Egypt south of Luxor, is the site of a remarkable temple complex, the majority of which to this day remains buried under the Nile silts. The Temple of Esna was built close to the river on the floodplain and apparently thousands of years of Nile-deposited sediments built up and filled in around the structure, such that in the time of Napoleon’s invasion of Egypt (1798-1799) only the tops of the highest columns and the roof of the temple were visible. The rest of the temple was under nine meters or more of sediment. Since Napoleon’s time the Hypostyle Hall, consisting of its walls, complete roof, and two-dozen columns – all covered with magnificent relief carvings – has been excavated, but the majority of the temple complex, and undoubtedly many other ancient structures, remain buried under the modern city. To view the Hypostyle Hall, one literally descends via a steep stairway into a pit below street level. The Temple of Esna is dedicated to a primordial creator god represented by, or associated with, the god Khnum (often depicted with a ram’s head, he was the “potter” who brought forth humankind and all living creatures from the clay) and his consort Neith (sometimes viewed as comparable to the Greek Athena). The majority of visible carvings on the excavated portions of the temple have been conventionally dated to Ptolemaic and Roman times (circa middle 2nd century BCE to middle third century CE) and include astronomical scenes, complex rituals, and inscriptions that have thus far eluded full interpretation. However, based on fragmentary older inscriptions, it is evident that Esna dates back thousands of years earlier. One wonders exactly how far back it could go. It is distinctly possible that the relatively recent Greco-Roman construction and inscriptions are an overlay on, and additions to, much older structures. An ORACUL field project at Esna could include detailed stratigraphic and sedimentological analyses of the silts and debris that have buried the temple, focusing on sampling pollens and other materials that can be dated and also used to reconstruct the paleoclimatic and floral history of the area. Detailed analyses could be undertaken of the complex inscriptions and symbolism on the exposed portions of the temple to try to shed further light on their meanings and origins. 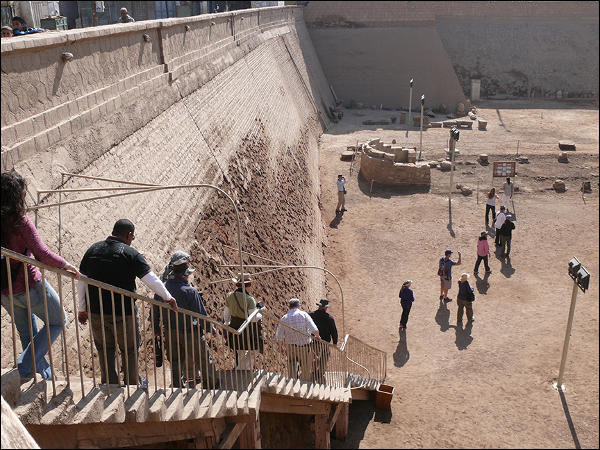 Perhaps most excitingly, non-invasive geophysical techniques, such as low-energy seismic techniques and GPR (ground-penetrating radar), could be applied along the streets and alleys of various parts of the modern city of Esna to reveal the layout and full extent of the temple complex and associated features that lie below the ground. 1) The systematic recording and comparative analyses of petroglyphs and geoglyphs (perhaps the most famous of which are the Nazca Lines and Geoglyphs of Peru) around the world from the Americas to the Far East. New geoglyphs have been discovered, for instance, in Kazakhstan and Russia. 2) On-site detailed studies of ancient construction techniques. The ancients shaped and moved huge megaliths – a phenomenon found around the world – but how? 3) Field studies focused on cross-cultural connections between the Old World and New World in remote ancient times, including the detailed documentation of applicable sites. 4) Ethnographic collection of “myths” and “legends” accompanied by comparative studies. 5) Re-analyses of classic sites such as Stonehenge (England), Mount Nemrut (Turkey), Petra (Jordan), Chaco Canyon (American Southwest), Tiahuanaco (Bolivia), and Machu Picchu (Peru) – to name just a few – questioning whether their dating and significance, as traditionally interpreted, stand up to scrutiny. 6) Explorations and excavations of controversial sites, such as Yonaguni in Japan and Marcahuasi (Markawasi) in Peru, about which there is disagreement among various researchers as to how to interpret the sites at the most basic level – for instance, natural or artificial? 7) Ground-breaking work, in collaboration with local researchers, on newly identified sites, such as Gunung Padang on the island of Java (Indonesia). As ORACUL grows, we plan to take on and support many different lines of research regarding ancient cultures. We are open to your suggestions!